People born after the 1990’s might not understand what film photos are, but anyone who came of age any time before that knows that the average person, and even more so, the average family, probably has boxes of loose, unorganized photos lying around in storage that are just taking up space. If you feel like this describes the current state of your photo collections, below are some tips for photo storage and organization. 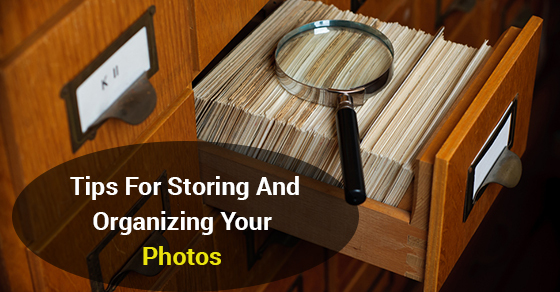 Document storage is about knowing why you are organizing and storing something. Are you going to be putting the photos aside for posterity? Do you want certain photos for a major life event like a wedding or a graduation? Do you just want to be able to access memories whenever the moment strikes, or when there is someone that insists on seeing a picture of you when you were ten? Keeping this in mind will make the storage process easier and more efficient. Before you begin to sort, you need to scour high and low to make sure that you have gathered every last one of your photo boxes. Collect all your printed, as well as framed photos and compile them together so that you eliminate redundant work and get the job done the first time. Photo safe boxes are essential for storing your photos and preserving them for the future. These boxes are archival quality, meaning that they are lignin and acid free. Keeping your photos in any old storage box not specifically designed to protect the integrity of photos will cause your photos to fade and deteriorate over time. It can be a distracting process sorting through photos. You start chronologically, and then start discovering all of the great holiday photos and before you know it, you’ve forgotten what you were originally looking for. The sorting process will be much easier if you keep to a specific organization method. Chronologically is usually the most popular, and the easiest because most printed photos have a time stamp on the back. If they don’t, hair and clothing style is always a good indicator. Photo storage doesn’t mean you have to actually go through and sort all of the physical photographs. One of the best ways to get photos out of the way, especially if you have a mountain of them and they are taking up an inordinate amount of space in your home, is to digitize the collection. Simply scan all your photos and then get the hard copies out of sight and out of mind. Sorting digitally is much more efficient, and it can feel less overwhelming without all the printed photos all over the place. A lifetime of photos is something to behold. It can be overwhelming trying to organize and curate all your photographs. Keeping the above tips front and centre, with a goal in mind, the right packing tools, and a method to your madness, can help you preserve all those memories in a coherent and stress free way that allows you to sort and reminisce at the same time.